Gough and Inaccessible Islands are two islands in the Tristan da Cunha archipel that are known for their undisturbed state and large seabird population. Both are volcanic islands rising from the South Atlantic Ocean, about 350km from each other. The designated area includes the surrounding marine zones of the islands. 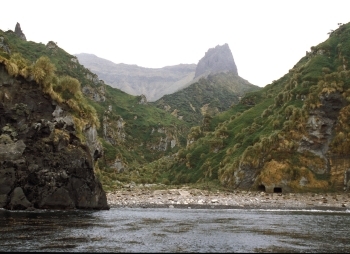 Gough Island (formerly also known as Diego Alvarez) is one of the least disturbed major cool-temperate island ecosystems in the South Atlantic Ocean and one of the most important seabird colonies of the world. Gough Island harbours almost the entire world population of the Tristan albatross and the Atlantic Petrel. Furthermore, it has two endemic land birds: the almost flightless Gough moorhen and the critically endangered Gough finch or Gough bunting. Its undisturbed nature makes it particularly valuable for biological research. Inaccessible Island is an uninhabited island, characterized by steep cliffs around its entire coastline (that's why it was referred to as "inaccessible"). It supports 10% of the global population of Northern Rockhopper Penguins and is the most important breeding site for Great Shearwaters. Inaccessible Island has been used by the islanders of Tristan da Cunha for economic purposes, and is now a wildlife reserve. I have never visited Gough Island but in my imagination I feel that I have! As a brother-in-law to John Heaney (55/56 scientific expedition) I was lucky to meet all the young men who were part of that expedition. Their London "headquarter" was my mother's flat at 11 Queen's Gate Gardens and I watched and listened as their plans were made and(more often than not), realized. London in those days - emerging from the aftermath of the war - was grey and dreary. This expedition, like Edmund Hillary's conquest of Everest, captured and stimulated our imaginations and helped us reach for new value in our world. Gough Island is the "ultimate" for us "WHS collectors"! But how to visit this "oh so remote island" where no one is even allowed to land - so important is it to keep its ecosystem pristine! Note that the UK has 3 remote island sites - StKilda, Henderson and Gough - added in 86, 88 and 95 respectively. Mrs Thatcher so disliked UNESCO and its then Secretary General Amadou Mahtar Mbow (in fact the US, which left in 84 in protest at his policies, has only recently rejoined) that, during her period in government, UK failed to register much of its undoubted heritage. But these remote islands were favoured and remain a remarkable trio - so unlike many of the other WHS which are heavily marketed, subject to high entrance fees and overcrowded with tourists (albeit that WHS recognition also helps stimulate conservation of others). In March 2002 we were lucky enough to achieve, albeit for a few hours, the ambition of visiting Gough Island and seeing some of its unique fauna. Each year, between late Feb and the end of April, the Russian vessel "Professor Molchanov" (on long term charter to a Dutch expedition company but still with Russian crew) is repositioned from its Antarctic cruising grounds to the Arctic via UK/NL. This trip is available to those with time (7 weeks) and money (not so much really considering the experience!!). En route from the Antarctic Peninsular it takes in most of the mid Atlantic islands - including Tristan da Cunha. Gough Island lies a few degress to the NE of a direct passage from the S Orkneys to Tristan. Looking on the world map it seems nothing but, for a ship whose maximum cruising speed is only 13 knots, the extra 100 or so miles represents a good half day's sailing. In 2003 however we had been blessed with calm seas and a good following wind and were going to arrive a day early in Tristan. The 42 passengers on this Atlantic Odyssey included many naturalists and bird watchers with dreams of seeing the unique Gough Bunting and Moorhen which had evolved on the island from much earlier vagrants. So, special permission was sought from the owners to divert - and given! The island is not in fact totally uninhabited but has, with UK agreement, since 1956, contained a S African weather station with some 6 staff. Their web site provides fine descriptions, photos and plans of the island. It is also interesting to read the sections on restrictions on import of any materials which could alter the delicate balance of life on the island. So we knew well that we would not be landing. Indeed as the island, with its 3000 ft summit and 1500 ft cliffs, emerged out of the cloud it looked as if landing was impossible anyway. In calm seas we carried out a near circumnavigation and marvelled at the waterfalls dropping sheer down the cliffs and the luxuriant vegetation - so different from that of the S Orkneys we had left some 4 days earlier - we had clearly moved into a very different climatic zone. Passing the weather station we called them by radio and asked permission to make a close passage by Zodiac at a suitable bay. The S African team had only seen one ship other than their own supply ship during their 1 year stint and were pleased to exchange news and grant permission! At the "Hags Tooth" - so named after the enormous volcanic plug dominating the landscape - there is a deep valley and a small beach which used to be the main landing place for sailors prior to the establishment of the nature reserve (The Geographical Magazine Volume 29 No 9 0f 1957 contains fine photos of the spot and the island in general as part of a report of a scientifc expedition to the island in 1955/6). It was there that we set out in 3 zodiacs to approach the island but going no closer than 50 meters to the shore. The Gough Bunting was in fact very easy to see but would we be lucky enough to spot the moorhen among the thick tussock grass? Yes - 3 came out to see what all the fuss was about. The "twitchers" among us were orgasmic! 1 person was heard to utter "My life is complete"! Keeping things in proportion, however, we were all very lucky and privileged to visit this "unique" (a much overused word) location. In far away Baghdad war was raging, in Gough the world was pristine and peaceful. Long may it stay so. PS The voyage continues via Tristan da Cunha and, for 3 years now (written 2005), has included a landing on Inaccessible Island which was added to the Gough Island WHS definition in 2004 (Unlike Gough, landings are allowed on Inaccessible if authorised by the Tristan Council and accompanied by local guides). There another unique bird species, The Inaccessible Island Rail, is available to be seen - there are likely to be enough twitchers in the party who will have armed themselves with recordings of its call and loudspeakers to play them to tempt it out! From "Gough Island Wildlife Reserve" to "Gough and Inaccessible Islands"
Critically endangered fauna species: Gough finch or Gough bunting (a songbird) - "estimated at c.1000 individuals in 2007"
Deepest: "the islands rise from a sea depth of about 3,500 m" AB. The boundary lies 12nm from the shore and appears to include "abyssal areas"
Named after individual people: Charles Gough, who reputedly rediscovered the island in 1731.